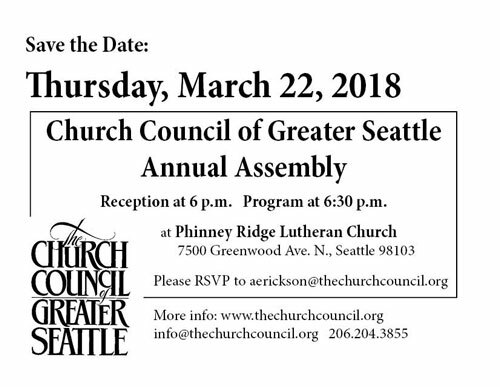 We write to formally invite you to the Church Council of Greater Seattle’s Annual Assembly on Thursday, March 22, at Phinney Ridge Lutheran Church, 7500 Greenwood Ave. N, Seattle 98103. We will gather for a reception at 6 p.m. and begin the programming at 6:30 p.m. Limited free parking is available – the church is also on the #5 bus line. Find directions here. The Annual Assembly is our major consultative event of the year. We continue to be in a kairos moment, a critical time, calling for the unifying voice and faithful witness of the church. We invite congregations to gather with other members of the wider church, to deepen connections, and to shape strategies for the work of the Church Council. There also will be formal business including reviewing the Church Council’s 2018 budget and affirming the Board of Directors and officers of the Board. Your congregation members will leave this event inspired to: participate in the collective power of faith in action; connect with neighbor churches to mutually inspire and ignite one another as agents of healing and followers of Christ; and, catalyze and collaborate for peace, justice and the well-being of all. Your voice is critical so that our work and ministry might be extended and deepened for the building up of our communities. Our unity will be strengthened by the offering of all the gifts of the ecumenical church to one another and with the wider community! Finally, a few additional details about participation in the formal business of the Assembly: As a congregation that belongs to a member denomination, your church is a member of the Church Council. As a member, clergy from your congregation plus two lay representatives are welcome to participate in the Assembly as delegates and vote on the matters under consideration. Additional members are encouraged to attend and participate in discussion. A bulletin insert, sample blurb, and .jpg save-the-date are available at www.thechurchcouncil.org and there’s also a Facebook event page. All are welcome. Please RSVP with the names of official delegates and any additional members planning to attend by contacting Ann Erickson ataerickson@thechurchcouncil.org or 206.204.3855 by Friday, March 16. This allows for an accurate count for food and materials. Even if you do not RSVP, you are most welcome to attend. If you have any questions, do not hesitate to contact Ann or Michael, who can be reached atmramos@thechurchcouncil.org or 206.204.3852.